Editor’s Note: I wanted to get this in before the Magic panel at SDCC, where hopefully they will talk about some of this stuff. My three-year-old daughter doesn’t know who Chandra is. She knows Batman, Superman, Wonder Woman, Iceman, Spider-Man, Firestar, Captain America, and Hulk are. She knows R2-D2 (whom she affectionately calls “Buddy”) and anyone in the Star Wars universe with a hood is called “Doom” (Yes, after Dr. Doom). There’s Red Doom (Darth Maul) and White Doom (Darth Sidious). Nicol Bolas and Ajani are a mystery to her. She rummages through my extra Dice Masters cards because she knows the characters. “Who’s this?” She asks, holding up Hawkman. I mention his name and she just shrugs. “Ok,” she uncaringly remarks while shoving the card into her pumpkin basket that she carries with her along with the Batman, Wonder Woman and Hulk cards. She doesn’t play Magic, so she can’t just appreciate the game or the characters just yet. There’s been very little exposure to the game aside from the Pop Funko figures above my computer while we play LEGO Star Wars. Is it my fault? Yes, expecting my three-year-old to pick Ajani out of a lineup of characters might be a tall task when compared to some of the most recognizable icons in the world (Wondering about Firestar? Well, she found the 80’s Spider-Man on Netflix on her own and embraced it). Of course, selfish me would love in the future for her to pick up Magic and play. I’m not going to force her by all means, but she knows about Daddy’s cards and looks at them from time to time. But with all of the attention and brand recognition that she’s getting elsewhere, will it just not interest her? She knows Hulk and Iron Man but not Jace and Ajani. This is about looking at what WotC can do to grab even more eyeballs and continue to gather some of that sweet green cash. Yes, Magic is doing fine, but it’s not as good as it can be. Constantly, it’s one of Hasbro’s best performing brands yet I feel it’s not treated as such. From what I understand, Hasbro is pretty hands off with WotC and creatively, that’s a good thing. But how to improve more people experiencing Magic, not just playing it, is another story. Hasbro (NASDAQ: HAS) is a global company committed to Creating the World’s Best Play Experiences, by leveraging its beloved brands, including LITTLEST PET SHOP, MAGIC: THE GATHERING, MONOPOLY, MY LITTLE PONY, NERF, PLAY-DOH and TRANSFORMERS and premier partner brands. From toys and games, television programming, motion pictures, digital gaming and a comprehensive lifestyle licensing program, Hasbro fulfills the fundamental need for play and connection for children and families around the world. The Company’s Hasbro Studios creates entertainment brand-driven storytelling across mediums, including television, film and more. And if you look closely, those 6 of those 7 brands have something in common: they’re constantly being played with by children under 10. The only one that isn’t: Magic. It’s the only one of those brands that doesn’t fit. Critics and people outside of gaming constantly refer to Magic as a “children’s game” when anyone playing knows it’s anything but. It’s a game with “Nerds and Geeks”. Obviously it’s not the only one with a subculture attached to it (My Little Pony), but it’s the only one of the group that has a product that Hasbro barely advertises (save legacy products like Monopoly and Play-Doh). If you’re surprised a fantasy card game is growing, even exploding, in the age of Candy Crush and Call of Duty, I was, too. Like many current Magicplayers, I started collecting in the late ’90s […] I gave it up for indie-rock fandom halfway through high school and never looked back, until Jacob, a college pal with a shared appreciation of music, literature and Mad Men suits, dragged me to a tournament days after my own wedding. “Yep. This game played by millions across the world is growing and no one knew. I used to play this in the 90’s and gave it up only to get forcefully thrown back into the game years later.” This is one of Hasbro’s most profitable brand: why is it treated like a shameful secret? People are attracted this this game. With Magic Origins, WotC needs to push the branding out there. Hard. You can see it in pieces, but it’s not completely there yet. This is a huge “soft reboot” if there ever was one. They’re telling the origin stories of five of their main characters and setting up for the future. They want you to get emotionally invested in their characters so that when they use them again, you have that attachment. That’s not saying that they won’t introduce new characters or go back to ones like Garruk (because they will), it’s just now they needed a starting point. Ask older players what their favorite storyline is. Most of them will most likely say the Weatherlight arc because of the characters (Brothers War should be a close second). There was a storyline that people could follow and you had memorable characters (something they’re trying to emulate now) When WotC ditched them, we didn’t have anyone to share stories with. Everyone we met on a new plane were “throwaway” characters because we knew they would be gone in a year. WotC hoped to fix this with “The Mending” and the introduction of these neo-Planeswalkers. And for the most part, it’s been okay. We’ve now finally got some swag with them on it like the Funko dolls. I found some wall stickers in a big box store with the Planeswalkers on them. Maybe some shirts you can buy from WotC. There’s a Heroscape-type Magic game that was just released, but somehow it was shipped to big box stores first instead of the LGSs. But there has been little else to push out these characters to have you, or potential players, buy something other than cards. Yes, WotC is there to make the card game since that’s what makes the big bucks. But, and this is the huge but, they’re owned by Hasbro which is a toy making company. You’d think that they would try and pump out this stuff like they do with their other lines to grab that “lifestyle” aspect. Magic Origins is the place to start for all of that. If you get all your branding and all your messaging out on the same page it becomes easier to sell the image. The Core Sets had to go because they constantly changed and except for keeping up with Duels of the Planeswalkers, there was no outside branding except for some Planeswalkers. This is some of the stuff you see Marvel start to do with their comic universe and cinematic universe. I remember when the Guardians of the Galaxy movie came out last year and there was branding of their comic books to tie into that movie. Even with that they’re doing now in the comic universe is like a soft reboot (much better idea than DC’s idea of just starting over). Magic fans aren’t just players now. There’s large enough niche areas where they can focus on things other than cards. People cosplay Magic characters but they don’t have the geek consciousness of being able to pick them out when you see them at a convention (Chandra could easily just pass as a Steampunk Woman). The designs for the Planeswalkers are great but the knowledge isn’t out there. “Yeah, I know Magic. Really, it’s still going?” WotC has their core group of fans, and the branding is slowly getting out there but I don’t think it’s enough yet. This is more than just selling toys, and I know that. Having your IP on the bag at PAX is huge, and it’s a step in the right direction. I know in the past that the novels haven’t been successful but what they’re doing online with the Uncharted Realms has been great. If you know about it. It’s not about trying to get Magic on TV again with ESPN 8 “The Ocho”, it’s about getting people want to stream your game on Twitch. I’d love to have the Microprose game on GOG.com for download. If there was ever a time to push Magic out to the masses, it’s now. “Get in on the ground floor before all the story gets crazy hot. You like big flying spaghetti monsters? You’ll love this Fall’s set. You want people with super powers fighting each other and causing drama? That’s what we’re going. Can Liliana be trusted? What’s Jace really up to? 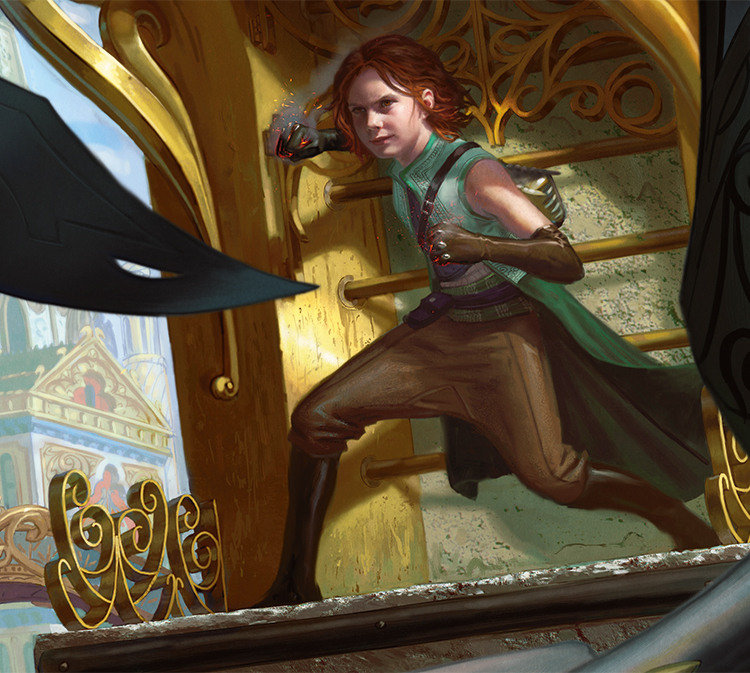 Can Nissa change? Find out!” That’s what works for story lines. It’s getting harder to fight for time and interest of people with so many strong IPs out there that can fill that void. Game of Thrones has passed Lord of the Rings as the go-to fantasy franchise. Why can’t Magic? Whenever the movie comes out and how well it’s done should hopefully be a shot in the arm for getting awareness. I would keep an eye on the World or Warcraft movie as a niche fantasy gaming genre stepping out into the big time. Lizzy, my three-year-old, looks at her father’s Magic cards and can identify them by color. She takes a handful of my bulk commons and shoves them into her pumpkin basket like a practice run for trick or treating. Not knowing what they are is fine, I don’t expect her to know how phasing works just yet. She just sees a ton of daddy’s cards and wants to play along. We know we can’t have every card be Planeswalker art or related; I think WotC’s doing pretty well with that mixture there. I’m not looking at WotC to make Planeswalker diapers or 3T shirts with cute Magic sayings on them for kids. I’m looking at 5 years down the road when she might want to start looking to play Magic if there will be anything there she can recognize. Maybe it’s because I have kids now and watch them light up when they see something they recognize (Lizzy gasps when she hears the Star Wars fanfare, Katie, my “19” month-old laughs when the Mickey Mouse Clubhouse song starts playing). Lizzy wanted the Jake and the Neverland Pirates diapers, she loves playing her Leap Frog Octonauts game and wants to watch Scooby Doo at night. I’ve seen what have recognizable characters does for buying habits and level of interest. We’re all guilty of this: that’s what swag is. WotC has the cards, and the storytelling in place. The brand needs to be out there more. This is the time when they’re “starting over” to do it. It’s easy for me to say when I’m an outsider looking in. It’s not like WotC doesn’t have the connections to make stuff like this happen though. Yes I can dream of a 15 minute length animated series done in the style of Samurai Jack all I want. The Heroscape game is a good way to go as long as it get support, otherwise it’s DOA. Go start something with this SDCC panel, WotC. We’re all waiting.